For the Orthodox Christian the Lord's Day is the first day of the week. Often it is also called the eighth day in honor Our Lord's Resurrection and the new life he brought. In the English language, and other languages of Germanic origin, the day is called Sunday or some linguistic variation. In many languages around the Mediterranean Sea the name for this day is derived from Lord's Day, while other languages including Slavic languages use a word derived from the word Resurrection. In the Judeo-Christian Scriptures, in Genesis, the seven-day week is defined after the description of God's efforts in establishing the world, and universe with the seventh day being the Sabbath, commemorating God's day of rest. In Apostolic times the practice is noted in Acts of meeting together on the first day of the week for Eucharistic Sacrifice which is called the Lord's Day in remembrance of our Lord's Resurrection. By the second century the Lord's Day was looked upon as the day of rest and the day for celebrating the Divine Liturgy, replacing the Jewish Sabbath. Then in 325, the Council of Nicea formally declared that the Lord's Day, Sunday, was the day of worship for Orthodox Christians. Naming of the days of the week began when the Romans adopted the seven-day week from Egypt during the early centuries of the Christian era using names from the then-known planets. When the Germanic peoples adopted the seven-day week from the Romans, they applied the names of the Teutonic deities to the days of the week. These Roman and Teutonic names have continued to be used today except that in some languages the first day has been renamed for the Lord's Day or the Resurrection while the seventh day may be called the Sabbath. In a large part of the world, the civil calendars have been altered, making Monday the first day of the week, thus placing Sunday as the seventh day. The practice of observing the Divine Liturgy on the first day of the week has its origin in Apostolic times. Then, the first day of the week was a day of special observance for the Christian community as it assembled to celebrate the breaking of the bread as indicated in Acts 20:7 and I Cor 16:2. Later, the Didache of the first or second century gives the injunction: "On the Lord's Day come together and break bread. And give thanks, after confessing your sins that your sacrifice may be pure." The Christian writers St Justin Martyr and Tertullian of the third century mention assembling for worship on the first day of the week. By the fourth century the practice of the earlier times of setting aside first day of the week for assembly and rest began to be codified in both civil and church canons and specifically for the Orthodox Church in the canons of the Council of Nicea. The Sabbath day is the seventh day, it is the day of rest in this world, the final day of the week. The next day, Sunday, is symbolic of the first day of creation, but also the last day of the Kingdom of God, the eighth day. The first day is also the eighth day, the day beyond the confines of this world, the day which stands for the life of the world to come, the day of the eternal rest of the Kingdom of God. The number eight has symbolical significance in both Jewish and Christian spiritual tradition in that it signifies more than completion and fullness. Eight signifies the Kingdom of God and the life of the world to come, seven being the number of earthly time. 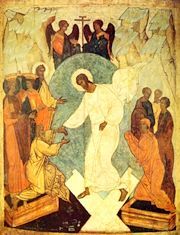 For Orthodox Christians, Sunday is the day of Christ's resurrection from the dead, the day of God's judgment and victory predicted by the prophets. Sunday inaugurates the presence and the power of the "kingdom to come", already within the life of this present world. It is a weekly celebration of Pascha. Liturgically, the Lord's Day begins at sunset of Saturday, with the vespers service. Many priests hear Confessions after this service for the faithful who are preparing for the Holy Communion in the morning. They also fast, usually starting at midnight. Before the Divine Liturgy, of Sunday morning, many parishes have the Matins service, some just read the Hours. The Divine Liturgy is always celebrated on Sunday morning before noon. Because of the resurrectional theme of the day, the faithful do not kneel at the Liturgy on Sundays. Litanies for the dead, memorial services, and blessing of graves were historically not permitted on this day, but in practices, it is now common. Thou didst rise on the third day, O Savior, granting life unto the world. Wherefore, the Hosts of the Heavens cried out to Thee, O Life-giver: Glory to Thy Resurrection, O Christ. Glory to Thy kingdom. Glory to Thy dispensation, O only Lover of mankind. and Thou didst raise the world together with Thyself. And mortal nature praiseth Thee as God, and death hath vanished. Thou art He, O Christ, that grantest unto all resurrection. Troparion of the Resurrection (Tone 2). O Lifegiver, Christ our God, glory be to Thee. Kontakion of the Resurrection (Tone 2) . and the dead arose, and creation at the sight thereof rejoiceth with Thee. And Adam also is joyful, and world, O my Savior, praiseth Thee for ever. for the Lord hath wrought might with His arm. He hath trampled down death by death; the first-born of the dead hath He become. and hath granted to the world great mercy. Kontakion of the Resurrection (Tone 3) . and didst lead us out of the gates of death. and together with them both the Prophets and Patriarchs unceasingly praise the divine might of Thine authority. Death is despoiled and Christ God is risen, granting to the world great mercy. Kontakion of of the Resurrection (Tone 4) . and He hath broken the gates of Hades, and, Master, hath risen on the third day. Troparion of the Resurrection (Tone 5) . Kontakion of the Resurrection (Tone 5) . Thou, as Creator, didst raise up the dead together with Thyself. Wherefore, we all cry unto Thee: Save us, O Lord. Troparion of the Resurrection (Tone 6) . Angelic Hosts were above Thy tomb, and they that guarded Thee became as dead. Thou didst despoil Hades and wast not tempted by it. Thou didst meet the Virgin and didst grant us life. Kontakion of the Resurrection (Tone 6) . and the Life, and the God of all. Troparion of the Resurrection (Tone 7) . Thou didst destroy death by Thy Cross, Thou didst open Paradise to the thief. O Christ God, and grantest to the world great mercy. Kontakion of the Resurrection (Tone 7) . for Christ hath descended, demolishing and destroying the powers thereof. ye faithful, for the Resurrection. Troparion of the Resurrection (Tone 8) . to burial of three days hast Thou submitted that Thou mightest free us from our passions. O our Life and Resurrection, O Lord, glory be to Thee. Thou didst raise up the dead and didst resurrect Adam. This page was last edited on January 2, 2009, at 00:14. This page has been accessed 36,338 times.